Here’s a real mystery, although a minor one, and like all real mysteries, it is incomplete and may have no solution. Exhibit 1: This postcard up for auction on Ebay. Here’s the front, Burmese fortunetellers. As for the postcard, we find that D.A. 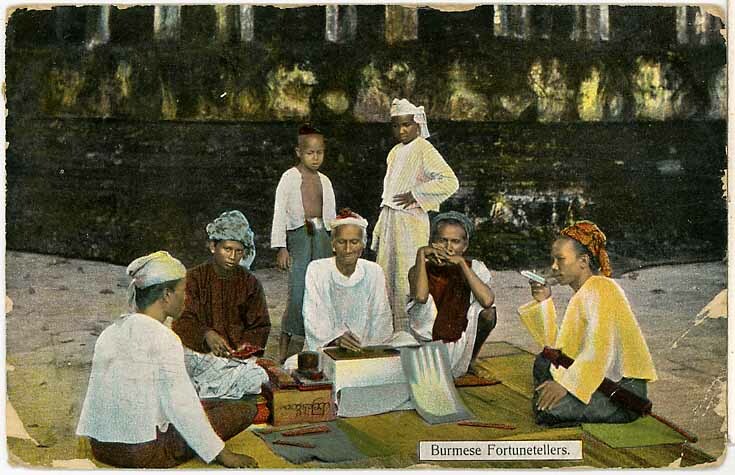 Ahuja of Rangoon published a series of Burmese cards. Presumably the card was sent during a voyage because it is stamped “Sea Post Office.” The stamp is from India, a 2 Annas, 6 Pies with the image of King Edward VII. (Here’s one that was used in Bahrain). “Kindly accept my sincere sympathies on the loss you have sustained. Was very sorry indeed to hear of the loss. It’s too bad there isn’t more to the message. Presumably the writer didn’t want to reveal too many details on a postcard. And doesn’t a photo of Burmese fortunetellers seem an odd choice for a sympathy note? Maybe it’s just me. Note the method of indicating the date, with the day first, then the month and finally the year. The easy guess is that the writer is not an American; but again, only a guess. Who is Val Leonard? A Proquest search turns up nothing. 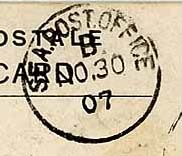 What’s curious is the cancellation on the stamp “_ASER STREET.” Unfortunately, it’s incomplete, but appears to say rather clearly “25 10 07.” One wonders whether the postal clerk neglected to change the month on the rubber stamp or if something else is afoot. Also note the address: 150 S. Vendome St., Los Angeles, California, USA is written in dark ink, while the name is so light that it’s nearly unreadable: Mrs. J.F. Hue—something. Or wait. Is it Mrs. J.F. Thie—something? I recall a Sherlock Holmes story in which the character wrote the name in one manner and the address in another, prompting Holmes to infer that the writer had to look up the address. 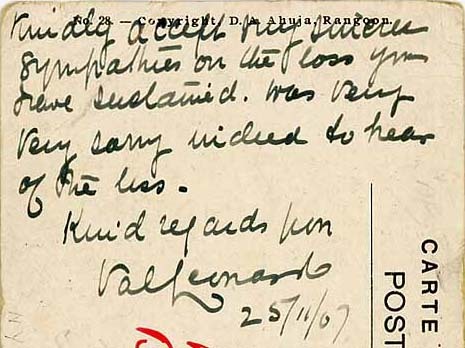 In this case, however, it seems that the address and message were written at the same time and the name at another. The question of why is one for Mr. Holmes. Unfortunately, the California death records for 1907 don’t reveal a Hue or a Thie, nor does Proquest, so this line of research comes to an abrupt halt. We can find out a bit about the address, though. 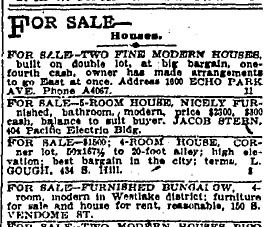 It was a house and was advertised for rent on March 7, 10 and 12, 1907. The question would be whether the loss occurred before March, leaving the house vacant, or after. The answer to that would involve the question of how long it took news of Mrs. J.F’s loss to travel to someone on a voyage and then how long it took the card to arrive. Presumably, it took so long that by the time the card was delivered that Mrs. J.F. had moved to Boulder, Colo. 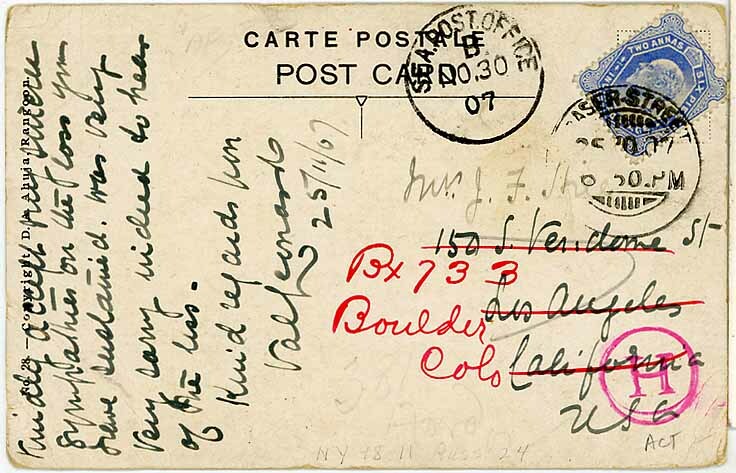 Note that it was a post office box rather than a fixed address. Holmes would have fun with that. So then, what was the loss? The absence of a Mr. and Mrs. J.F. points toward the loss of a husband, but it could easily be some other loved one. Now wait a minute. Maybe that’s an “S” as in the capital S of "S. Vendome." Hmmm. Maybe it’s Mrs. J.F. Shie. 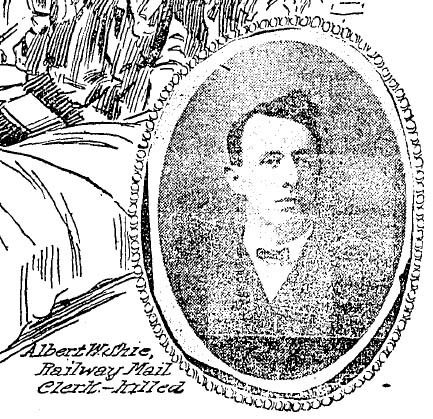 Proquest is seemingly helpful here: A mail clerk named Albert W. Shie was killed in a terrible railroad accident at Colton, Calif., on March 29, 1907, which is shortly after the house at 150 S. Vendome was up for rent. The Times says that Shie had been working on the train from El Paso to Los Angeles for five years and lived with his wife at 555 Ruth Ave. in Los Angeles. Is this Mrs. J.F.’s loss? Presumably she might be Albert Shie’s mother, but given the information available, it may never be clear. A fun mystery, thanks to Ebay.